Letter of invitation : This is an official letter from the Iranian Ministry of Foreign Affairs which enables you to collect your visa from your desired Iranian Consulate in your country or elsewhere. Getting this authorization code is the most important step in visa application. This letter will be issued based on your request and our application of the request through the Ministry of Foreign Affairs. I take care of your letter of invitation/Authorization Code in a quick, simple and discreet manner. I provide you with an easy and convenient solution to your travel needs. A. Please send me above mentioned documents. * Please ensure you fill in and send the necessary documents correctly. I cannot be held responsible for the mail or an application which has been sent to us in an incorrect manner. * Once the reference number is granted you cannot change the embassy choice. B. In about 10 working days MFA will update us with your letter of invitation/authorization code status. C. The Ministry of Foreign Affairs will fax your invitation letter/authorization code to the Iranian Consulate of your choice. Then you will have provided invitation letter/authorization code. You will call that Iranian Consulate of Iran to ascertain that your invitation letter has arrived. If your invitation has arrived, go to (E). If has not arrived, go to (D). D. If your invitation letter/authorization code has not arrived, you should inform us and ask that it be sent again. We will contact the MFA and request the letter/code to be sent again. 1. You will go to that Iranian Consulate with the authorization code and your passport in hand and receive your visa within 1 or 2 working days. 2. You may post your visa authorization code and passport to that Iranian Consulate. You should receive your visa by post after one working week. MFA: Ministry of Foreign Affairs. 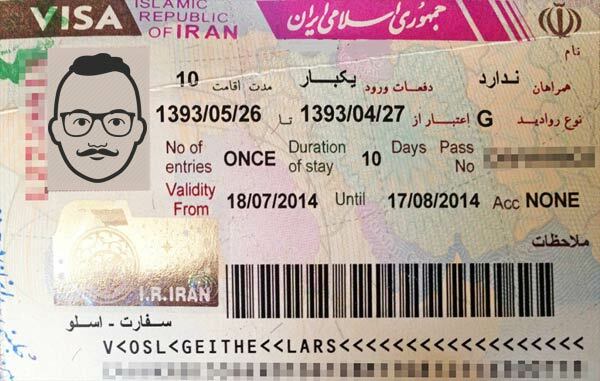 The Visa Department within the MFA is responsible for issuing letters of invitation/authorization code for tourists and businesspersons who want to visit Iran. Service Fee: This is a fee which I receive from the you for processing of a letter of invitation(LOI)/authorization code. Service fee is 40$ per person, this is apart from the visa fee which will be collected when your visa is stamped in your passport. The payment method will be arranged with you after you have applied. You have to take into account about 10 working days for the letter of invitation/authorization code to arrive. In some cases, the procedure can be expedited. Normally, three days after the receipt of the invitation letter, the application procedure for visa can begin at the embassy. Remember that using, and paying for this service is not a guarantee of getting a visa, and you won’t get your money back if your visa is not issued for any reason or even if you cancel the process. To avoid most problems, start the process as early as possible.